I’ve never attempted to make pita bread. No, not once. Those little pockets are pretty intimidating! Especially for a girl that is a little afraid of bread since it is so temperamental. Learning the new steps, and asking “how many times does this have to rise?” only made the experience more fun and rewarding. These were a stretch for me but I enjoyed them immensely as piping hot pita dipped in homemade Tzatziki sauce. These are a bit time consuming so whip them up on the weekend to take to work during the week. 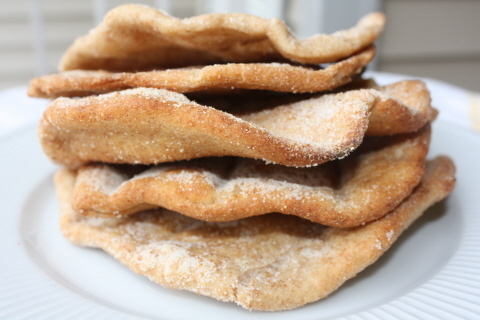 WHOLE WHEAT PITAS – original recipe taken from Confections of a Foodie Bride and copied here. Set oven rack in middle of the oven. Preheat oven to 500°F. Punch down dough and cut into 8 pieces. Form each piece into a ball. Flatten 1 ball, then roll out into a 6 1/2- to 7-inch round on floured surface with a floured rolling pin. Transfer round a baking sheet lightly sprinkled with cornmeal. Make 7 more rounds in same manner, arranging them on baking sheets. Loosely cover pitas with a clean kitchen towel and let stand at room temperature 30 minutes. Transfer 4 pitas, 1 at a time, directly onto oven rack. Bake until just puffed and pale golden, about 2 minutes. Turn over with tongs and bake 1 minute more. Cool pitas on a cooling rack 2 minutes, then stack and wrap loosely in a kitchen towel to keep pitas warm. Bake remaining pitas in same manner. Serve warm. They are as delicious as they are pretty!